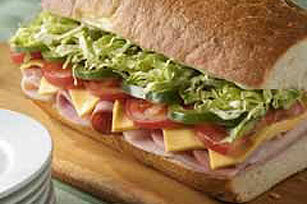 Try making our Super Party Sandwich Recipe for your next group event. The zesty Italian dressing and mayo give this party sandwich recipe a memorable kick. Mix mayo and dressing until blended; spread onto cut sides of baguette. Prepare using an Italian or garlic bread loaf.